: Voting for the Sheenazing Awards is CLOSED. Voting for the Sheenazing Awards is CLOSED. Thank you for participating in the 4th Occasional Sheenazing Awards! We are here to acknowledge and celebrate all the people who put themselves out there on the wild west of the internet for the greater glory of God and for the plain ole fun of it. We are also here to honor Venerable Fulton J. Sheen, a man who loved God and His Church with his whole heart, mind, and life. Archbishop Sheen passionately shared the Gospel with whoever he could through whatever means were available to him. He is an inspiration to me and so many of us who love to share our lives through new media. These awards are named for him. Please take a moment to review all the nominated blogs, podcasts, and social media accounts. There will surely be some that are new to you and I hope you add them to your feeds and share new finds with your friends and followers. At the bottom of the listed nominations you will find the link to the Official Sheenazing Awards Voting Ballot. - Every nominated blog, podcast, and social media account was reviewed to ensure that they honored God, were written by a Catholic, and were appropriate for the listed category. - Per the stated rules, nominations had to include URLs and nominations without URLs were discarded. - Many, many thanks to the eight members of the Official Sheenazing Awards Advisory Board for their guidance and support. - Additional thanks to my Dr. Pepper loving, Texas forever friend Kathryn Whitaker for her invaluable help. - You do not have to vote in every category. - You may only vote once; duplicates will be deleted. - Voting will close Thursday night and the winners will be announced on Friday, August 10th. - This is for fun so have fun! These are sorted by type but in the end you can only vote for one, be it IG account, blog, YouTube channel, or podcast, and not one in each. VOTING IS NOW CLOSED! Thank you to everyone who nominated and voted!. This is so great--thanks for taking the time to put it together! Just one question--when are the votes due? Great question! Voting will end Thursday night and the winner will be announced Friday of this week. So many good people to choose from!!! I also love the Catholic Artisan category! I have so appreciated the art that I’ve purchased from these catholic artists and I love knowing about the women I am supporting!! Yes! Someone suggested that category and I'm so glad they did! It's great to support small business while we live out our faith. Thanks for doing this again, Bonnie. So fun! My pleasure! Thanks for being part of it! Thanks for doing this, Bonnie! It must be a lot of work putting this together, and I know I'll be having fun going through the unfamiliar names. Honored that my small potatoes neglected blog is nominated too! Will this list stay up after voting closes? I’d love to refer back to it as a resource for discovering new people! Yes! I list the winner and the two runners up at the top and then leave the rest of the list as is. It will stay forevah! Please tell me you will keep this list up and links active for a while, such a wonderful resource! Would love to see Simcha Fisher listed here. Wow, I am so honored and humbled that my lil' blog was nominated! And that my younger brother was nominated! And I am SO EXCITED about this awesome list of Catholic creative people that I can come back and reference later on. Thank you so much for doing all of this hard work! I think you're pretty Sheenazing yourself, Bonnie. 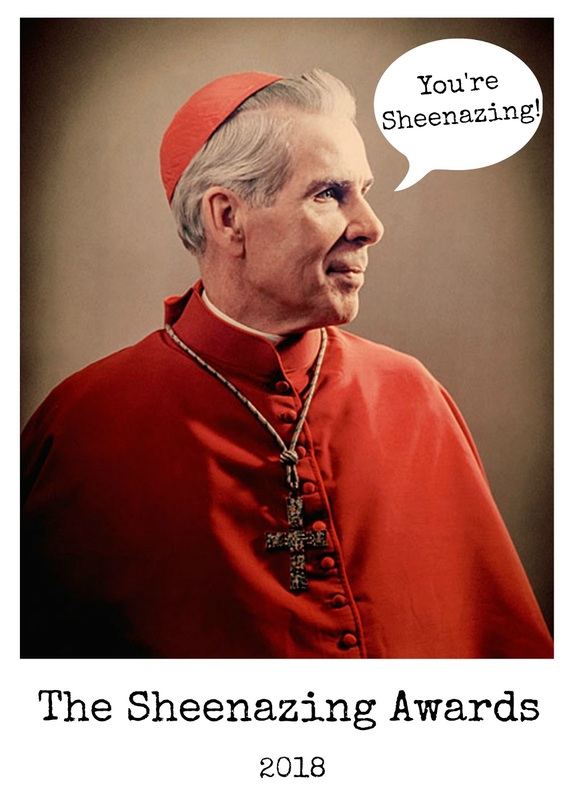 By the way, I think you would appreciate this-my 2 year old really likes reading the poem about Fulton Sheen in one of his picture books, and once I even pulled up a clip of Sheen on youtube for him, he gets excited at seeing Fulton Sheen. BUT even though he has a fairly good vocabulary, he cannot seem to say "Fulton Sheen." Instead, his name for Sheen is "Fulton-neena." The other night when we were doing a little litany of saints at bedtime prayer, my 2 year old spontaneously added "St. Fulton-neena, pray for us" and it was adorable! (and hopefully a foreshadowing of a canonization in the future?). I can only hope to be listed here in a category someday! There is so much inspiration in these lists.